Opposition leader Sam Rainsy discusses Cambodia's political situation with RFA, June 15, 2016. Cambodia National Rescue Party (CNRP) President Sam Rainsy wants to end his self-imposed exile in time to cast a vote in the country’s upcoming elections, but he faces arrest upon returning. He left the country following his removal from parliament in November 2015 by the ruling Cambodian People’s Party (CPP) over a warrant issued for his arrest in an old defamation case. With voter registration in Cambodia running from Sept. 1 to Nov. 29, if he wishes to register, the window of opportunity for his return is relatively short. Local elections are scheduled for 2017, and national elections are slated for 2018. In interviews with Radio Free Asia Khmer Service journalist Sarada Training this week, Sam Rainsy discussed his desire to return, what it would take and the campaign Prime Minister Hun Sen and the CPP are waging against the opposition. RFA: What makes you believe that you will be able to return to Cambodia? Sam Rainsy: It is based on my personal past experiences. It is not the first time that I have been forced into exile. This is the fourth time now. For each of the three previous occasions, I was always able to partake in the elections. I strongly believe that there will be a political solution, not just for myself and Kem Sokha, but for all jailed CNRP activists and NGO workers. RFA: What would you need to secure your safety so you could return to Cambodia? Sam Rainsy: I believe in international pressure. It works very well, and it will work again to defuse this current political tension. None of the previous political solutions came without international pressure. No government can survive without international support. Cambodia is not an exception. What the current government is doing against the opposition party is savage. That only increases international pressure. At some point, a solution must be found. RFA: Kem Sokha has been holed up in the CNRP headquarters because of the actions by the government in relation to the cases involving his alleged affair. Now that the voter registration period is coming up, do you think he will be able to register to vote? SAM RAINSY: The CNRP is not made up of just one Kem Sokha and one Sam Rainsy. It has millions of Kem Sokhas and Sam Rainsys in Cambodia. About 10 million Cambodians are voters. They want change. This change can only happen when all together we vote for the CNRP. What is most important is that we are united and ready to vote for the CNRP in the next elections. The CNRP victory is for all Cambodians. RFA: You are in exile. Kem Sokha is in hiding. Prime Minister Hun Sen is launching an early political campaign in different parts of Cambodia. Do you think there will be a free and fair atmosphere for the next elections? 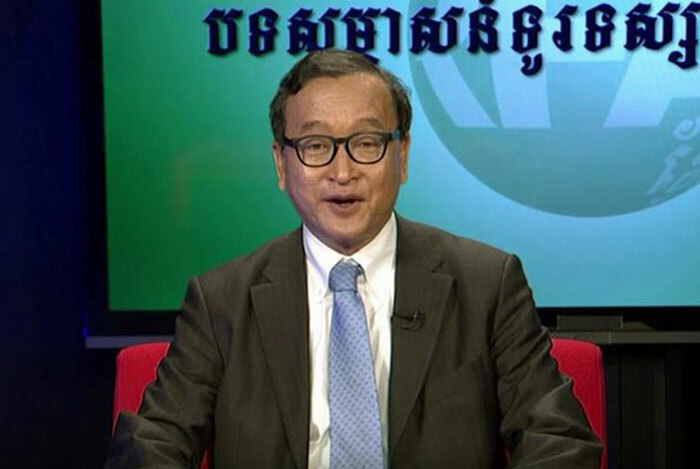 SAM RAINSY: Regardless of how unfair and unfree the elections could be, Cambodians are clearly aware of that. The ruling party is in a panic mode now. They are so frustrated about losing the elections that they have resorted to using the court and killings to intimidate the opposition. They know very well that if the elections are free and fair they will lose. Such cheap and savage means employed by the ruling party against us are enough to let people better know that we are stronger. RFA: Does that say something about the CPP? Since the CPP only persecutes the CNRP it means that the CPP is losing faith in its own ability to make a difference. Though there are several other political parties, the CNRP is being harassed by the CPP constantly and persistently. Cambodians trust only the CNRP to save our country from the current regime of dictatorship. RFA: If you and Kem Sokha are banned from registering to vote, will the CNRP boycott the next elections? SAM RAINSY: No, it won’t. We will do our best to push for the elections. The change we envisage has to happen through peaceful means and through free and fair elections. I have strong faith in our people, and they will go out to vote for change. Translated by Nareth Muong for RFA’s Khmer Service. CNRP must not take for granted in explaining to people what's at stake, the future of Cambodia and the next generations. Do they want the same murderous corrupt government for another 5 years or do they want change. Do they want to live in fear or free from fear?